As OtherwhileTales is supposed to be - at least in part - a blog about writing, I thought I should show an alternate view after Lemnick's brief survey. For all he's a pretty long-winded kind of chap, he at least managed to get a good general guide to the whole of Otherwhile into a couple of pages. 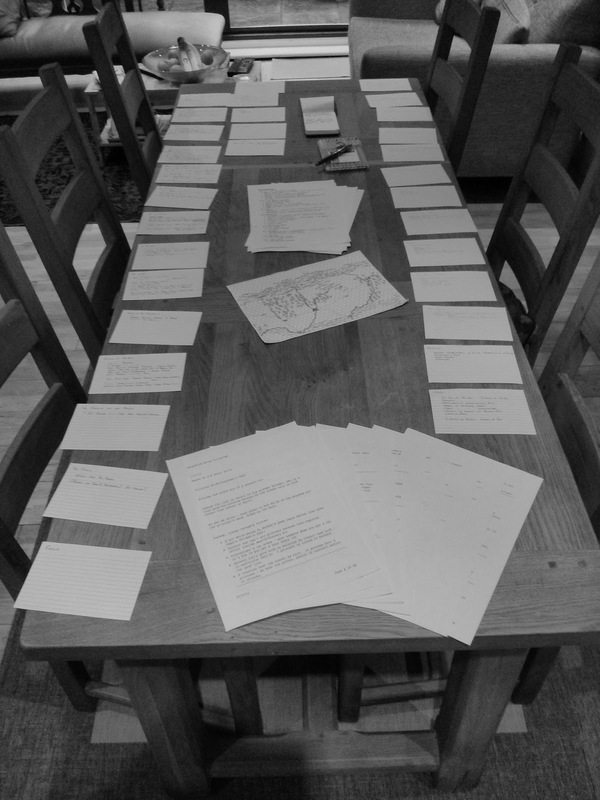 I, on the other hand, have had some difficulty in getting just one Otherwhile Tale into a whole kitchen table (plus one extra table-leaf, I'll have you know), as you can see below. The following is taken from an intercepted report by Lemnick of Carysfort, a merchant, spy and frequent thief, formerly an ambassador to Otherwhile from the Kingdom of Shende. I can only apologise for his verbosity and Love of Excessive Capitalisation. ... It is perhaps indicative of the somewhat solipsistic attitude of the average Otherwan (for so they style themselves) that they should refer to their country, the region surrounding their country and, indeed, the world of which their country and region form but a small part, as Otherwhile. Despite the grand self-image implicit in this taxonomic eccentricity, Otherwhile itself is neither a large nor a particularly significant state. To cross its widest point from East to West would be a journey of some One Hundred and Ten leagues, to travel from North to South being a shorter trip of a little above Fifty. It nestles below the long range of mountains known traditionally as The Spine of The World and is bordered to the South by the Melwyst Hills and the River Tredanna. Between the mountains to the North and hills to the South, Otherwhile is rolling country. Extensive forests can be found to the North-West and the East, the two wooded areas divided by a mountainous rib descending from The Spine of The World. The country is home to many small villages but only a few larger settlements, notably Melch in the farming region south of the Phildra Forest and Yassock and Runne in the East. The country's capital is Farla, known as the City of Three Rivers, standing as it does at the point where the Rivers Krist and Malawl join to form the Tredanna. Farla itself is a noble-looking place, if small and - dare I say? - a trifle placid when compared to our own Carysfort. Its roads are rather wider than the norm and its buildings - constructed from the green-grey rocks of the region - tend rather towards height than width, as indeed do the Otherwans themselves. At the city's centre lies the Isle of Wharrid, home to the Royal Palace, a construction distinguished neither by size nor by taste, whose chief merit is the thickness of its walls and defensibility of its position. The Palace was first constructed nearly Six Hundred years ago by Arbor Vulpa, the first member of Otherwhile's current ruling dynasty. Interestingly, Vulpa is described even in the most hagiographic Otherwane texts as a "thief, gambler and inveterate drunkard". Though this be an affront to all right-thinking persons, the common Otherwan will insist that these undisputed facts do little to distinguish Arbor I from the rulers of any other nation. Indeed, Arbor is upheld as a great national hero and the man whose theft of "The Heart of The World" wrested rulership from the mysterious (and doubtless entirely fictive) Queens of Morn, Midday and Eve, who - according to the national myth - ruled Otherwile for the thousand years before Arbor's coming. Even to this day it is rumoured that the eldest child of the Vulpal line must always be schooled in the criminal arts and is sent away to the notorious academies of distant Afar for this purpose. As well as being the nation's temporal capital, Farla also houses the Great Cathedral of the Absented, perhaps the most important site of pilgrimage in all the Continent, and a University of great age and no mean renown. But beyond all this Farla is famed for its Clock-Crafters, men and women of great skill, whose intricate mechanisms, all exquisitely cased, command the highest prices wherever they can be found. In all, the population of Otherwhile is estimated at several hundred thousand souls. Its chief industries - Clock-Crafting aside - are Farming, Merchantry, Silver-Mining (the mines being located on the Southern Side of the Spine of The World) and Lumbering. In the absence of the wise imposition of sumptuary laws as in our own country, all and sundry from the highest in the land to the most meanly born are given to displaying what wealth they have through their clothes. Brightness of colour is universally regarded as being all to the good, with strong greens and reds looked on with particular favour. It is, all in all, a complicated and somewhat embarrassing currency in which to do trade. I should begin by saying thanks to everyone who's spent a moment or two in Otherwhile over the past few days and even greater thanks to those who've sent them here. It's good to have your company on the sometimes lonely road to ... well, to wherever Otherwhile is going. There are all sorts of rumours about what's going on - stricken rulers, missing heirs, a sighting near the Phildra forest of a toad with a retinue of zombie flies - so it's pretty clear something is up but the discovery of exactly what's going on will need to wait a little while I gather together some information about Otherwhile itself so we can all orientate ourselves (over the years I've got lost here more times than I'd care to mention, possibly because I often find myself treading Otherwhile's muddy pathways in those odd, half-unreal moments before falling asleep). With regard to getting more information, I'm happy to say that I've managed to turn up part of a report from a former ambassador to Otherwhile giving a brief description of the land and people, which should be appearing here in the next couple of days. I hope you find it useful. Until then, thanks again for visiting. I hope you're enjoying your time here. And if you have any questions, just click on the comments and ask away. The promised survey of Otherwhile is now available here. But no, I should begin at the beginning. Which is what I did. It was a story about a boy with one eye of blue and one of lavender, the sixth son of a seventh son, who had to go on a quest to find the Truth. I remember being very pleased with it, though not as pleased as I was with the smell of the someone's hair or the feel of her tired weight against my shoulder. Being me, though, the story got hold of me and carried me away and by the time it let me go, with the sixth son triumphant, Truth discovered and evil vanquished, the someone was asleep. Ever since, I have been far too willing to be carried off by stories when there was something much, much better to do. That particular story, of the sixth son of the seventh son, was the beginning of Otherwhile. It's not precisely a world and not precisely a country, though it's been both in its time. It's not Fairyland or Faerie (and anybody who spells "magic" with an extra "k" should know it has a distressing lack of designer-stubbled woodcutters and goth-lite princesses). It's home to stories that have a whiff of homely myth about them, a pinch of Grimm here, a dash of Arabian Nights there. Some have been quite serious and have had terribly pretentious endings. Some are quite sweet. And all have given more flesh to a place in my mind that is neither here nor now. Now Otherwhile is looking to grow, to become a country and something more, a place with mountains and forests and rivers, a placed that cartographers can march across and measure, a place with people who can be talked to and listened to and cried for and laughed at, a place where deeper, longer stories can be told. Indeed, it's a place where one particular story wants to grow, a story about a sixth son of a seventh son, with one eye of blue and one of lavender. And as land and story grow, I'll pop in here to tell you, my (almost certainly notional) reader, about them, giving some idea of how the sixth son's story is coming together and exploring the history and geography of Otherwhile along the way. I'll also take the chance to let the odd old story shake off the years and scamper around in Otherwhile's green fields for a bit. The result, I hope, will be in part a writer's blog, in part a gazetteer of a world that until now has only been visible in my mind's eye.